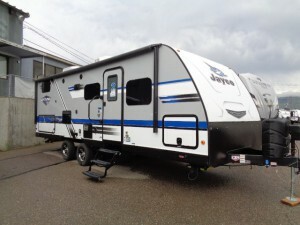 A travel trailers main job is to provide a homey place to sleep and camp. 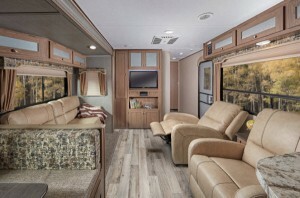 However, it does not hurt to experience the many luxuries a travel trailer while you’re exploring the great outdoors. 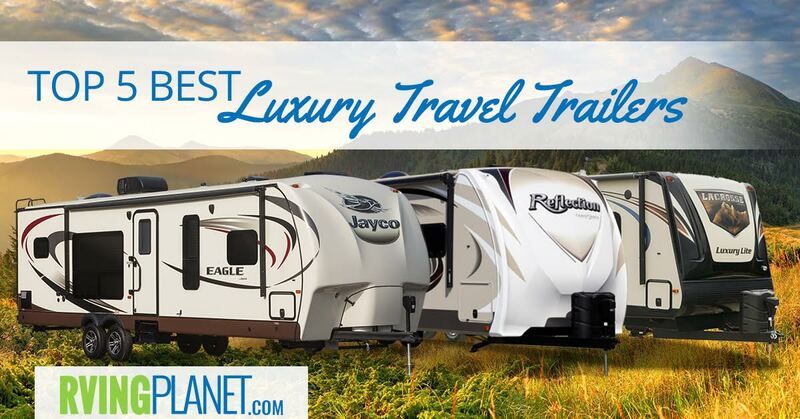 We’ve put together the 5 best luxury travel trailers in the market. Let’s take a couple minutes to explore the top models! What puts an RV on the list: There are many factors that come into play when selecting luxury travel trailers. However, our top 5 list are the ones that have the best-in-class features, design, reviews, ratings and build quality to speak of. Most of them come with a premium price tag, but considering the look and feel they provide, it’s totally worth it! 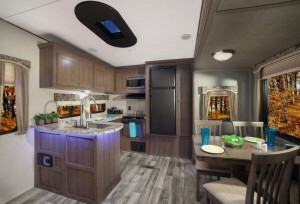 View All Grand Design Reflection Travel Trailer Floorplans! Why we recommend the Grand Design Reflection travel trailer: Just one quick look, even from the outside, and it’s apparent that the Grand Design Reflection travel trailer lives up to the hype. 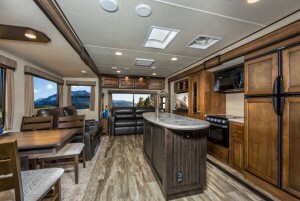 Apart from it’s long list of features and luxury offerings mentioned below, all of this goodness comes in 5 different floorplans that range from 7000 to 8000 pounds making it an ideal weight range but if you’re interested in having a travel trailer that you can tow using any half ton vehicle, then check out our other top choices below! We particularly preferred the Reflection 315RLTS and the Reflection 285BHTS for their sleeping capacities, but the features are more or less the same across all of the floorplans. Some of the luxury ones are a wide view shower skylight that gives it an jaw-droppingly beautiful look, hand rubbed maple cabinet doors that provide style, substance and storage, and a huge king sized wardrobe if you’re planning on going for a long trip across the country! Why we recommend Keystone Hideout travel trailer: If one word were to do justice to the Hideout apart from spacious, it would be versatile. 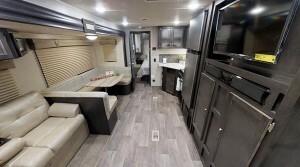 Keystone has managed to provide 44 different floorplans of this travel trailer which cover a wide range of weight, length and sleeping capacities. We particularly liked the Hideout 28RBS and the Hideout 32BHTS. There is such a large amount of choices they provide, it’s best if you check out every one of them and decide for yourself! Feature-wise, there’s a lot going on with the Hideout, especially in terms of luxury. A full walk-on roof allows you to camp and enjoy the view, or maybe you’re just interested in relaxing on the sofa and enjoying watching TV with the internal surround sound speakers. There’s also a lots of storage provided, including space under the master bed apart from the usual spaces you find in travel trailers. 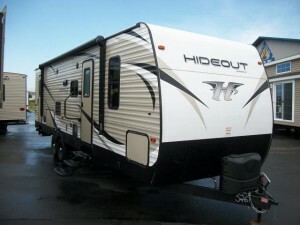 All in all, you’ll enjoy the look and feel of Hideout as well as find it to be equipped with the useful features. 44 different floor plans available! 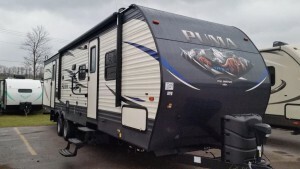 Why we recommend the Palomino Puma travel trailer: The Puma definitely deserves a spot here as due to the numerous of floorplans and the versatility it provides. 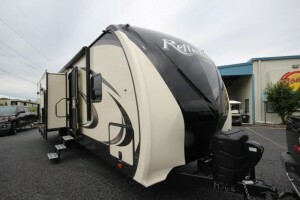 But more importantly, it has the luxury features that few other travel trailers can provide in its price range. But those features remain same no matter which floorplan you chose. 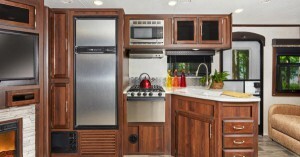 For example, we liked the Puma 32RKTS, but some other floorplan such as the Puma 27RLSS has the same decorative kitchen backsplash among other features listed below. 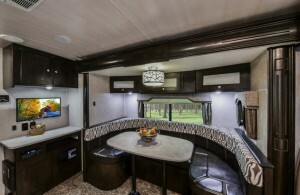 The Puma covers both the aspects of a luxury travel trailer: style and substance. The choice of 4 interior decor and bath skylight makes the travel trailer look premium, white the jackknife sofa and the nickel finish kitchen faucet add to convenience by providing high quality amenities that you could use. By the way, the sofa has also underneath storage to store extra items in along with a pull-down center drink tray. The list doesn’t end here! 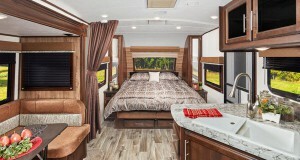 One look at the upgrades and expansions and you’ll realize that we’ve only scratched the surface of the real potential of this travel trailer, making it an obvious choice to this and many other top 5 lists! 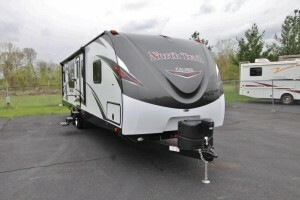 View All Heartland North Trail Travel Trailer Floorplans! Why we recommend the Heartland North Trail travel trailer: The North Trail by Heartland has a lot going on about it, even if it seems drasitcally similar to the other choices when it comes to specs on paper. 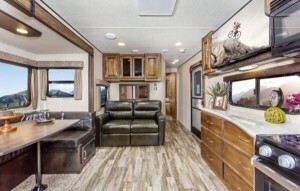 Sure, there are many other travel trailers that provide a myriad of floorplans, but none of them can provide the level of quality and the versatility of the North Trail. You can start off with a 4450 lbs floorplan if you really need something lightweight or go all the way up to a floorplan that weighs over 8000 pounds but provides 37 feet of legroom! You can go for our recommended North Trail 33 BUDS or the North Trail 31BHDD if you wish for better space, but the compact ones don’t sacrifice on the luxury. You can still enjoy its awesome LED HDTV that swivels so you can view it in the bedroom and let your eyes gaze on the look that the designer accent walls and the decorative glass inserts provide. If you’re aiming on taking the action outside, there are numerous other ways that the travel trailer will prove to be a luxury one such as the inclusion of outside speakers. All in all, the North Trail gives us no reason to believe that it doesn’t belong on this list! 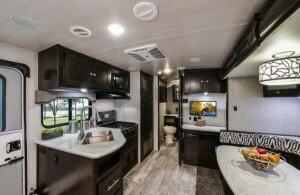 Why we recommend Jayco White Hawk travel trailer: One of the most important aspects about a luxury travel trailer is the decor, which seems to be the strong suit of Jayco White Hawk travel trailer, as it has 3 different decor options available. Apart from that, it has many floorplans so you really have a lot of choices and will end up with a travel trailer that you truly like. We really liked the White Hawk 32 BHS and the White Hawk 31BH but, as we said, the possibilities are many, so be sure to check most, if not all of them out! 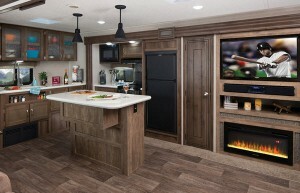 Apart from the decor, there’s lots of other subtle and not-so-subtle additions to the travel trailer that make it truly luxurious. Take, for example, the woodgrain accent paneling, bathroom skylight, an auto-ignition furnace along with a thermostat among others. The list doesn’t end here though, as there are many upgrades available if you want to give this camper an ‘oomph’ down the line. Some of the available options include tub surround, an upgraded air conditioner, a second air conditioner, kitchen skylight and frameless windows. Top 5 Best Travel Trailers Under $20,000 On A Budget! If your hearts a bit heavy bidding adieu to all the luxury look and feel of your home when leaving for camping, fret not, for these travel trailers will provide the same atmosphere of living, all whilst traveling throughout the country! Share with us your favorite luxury travel trailers in the comments below!